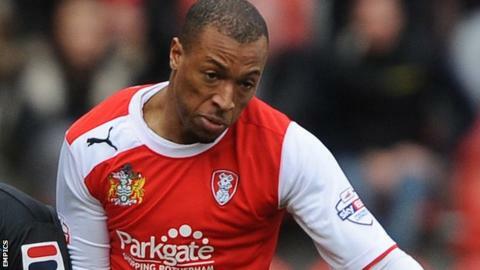 Wes Thomas scored twice as Rotherham beat Swindon to secure a League One play-off meeting with Preston. The Robins were behind after 58 seconds when Thomas latched on to Ben Pringle's pass to score in the left corner. The pair combined again as Thomas doubled the lead with a far-post header, before Michael Smith reduced the deficit from the penalty spot. Jay McEveley came close to an equaliser when his 30-yard shot hit the bar but the Millers held on for the win. "First half we didn't turn up, that will have taught them a lesson. That's not acceptable. "Second half we got the required effort and desire, and could have easily got something out of the game just by upping the tempo and getting about the pitch. "The players have been brilliant (this season), they deserve all the credit in the world. "The way they were thrown together and to finish in the top half of the table I'm very proud of them." "We made some big changes to allow people with some opportunity to stake a claim. "I though we were terrific. First half we were exceptional and we should have been over and dusted with the dominance. "It's going to be tough. It was tough at the start of the season to try and get into the play-offs." Match ends, Swindon Town 1, Rotherham United 2. Second Half ends, Swindon Town 1, Rotherham United 2. Attempt missed. Jack Barthram (Swindon Town) right footed shot from outside the box is too high. Hand ball by Louis Thompson (Swindon Town). Substitution, Swindon Town. Matty Jones replaces James McEveley. Corner, Swindon Town. Conceded by Michael O'Connor. Attempt missed. James Tavernier (Rotherham United) right footed shot from outside the box is too high from a direct free kick. Corner, Swindon Town. Conceded by Richard Brindley. James McEveley (Swindon Town) wins a free kick on the right wing. Foul by Richard Brindley (Rotherham United). Substitution, Swindon Town. Will Randall-Hurran replaces Connor Waldon. Substitution, Rotherham United. Haris Vuckic replaces Tom Hitchcock. James Tavernier (Rotherham United) wins a free kick in the attacking half. James McEveley (Swindon Town) hits the bar with a left footed shot from outside the box following a corner. Corner, Swindon Town. Conceded by Kári Arnason. Jack Barthram (Swindon Town) wins a free kick in the defensive half. Tom Hitchcock (Rotherham United) wins a free kick on the left wing. Attempt saved. Nathan Byrne (Swindon Town) left footed shot from the centre of the box is saved in the top centre of the goal. Massimo Luongo (Swindon Town) wins a free kick on the right wing. Goal! Swindon Town 1, Rotherham United 2. Michael Smith (Swindon Town) converts the penalty with a right footed shot to the bottom left corner. Penalty Swindon Town. Massimo Luongo draws a foul in the penalty area. Penalty conceded by Kári Arnason (Rotherham United) after a foul in the penalty area. Substitution, Swindon Town. George Barker replaces Ben Gladwin. Corner, Swindon Town. Conceded by Robert Milsom. Attempt blocked. Michael Smith (Swindon Town) right footed shot from the left side of the box is blocked. Attempt saved. Michael Smith (Swindon Town) header from the centre of the box is saved in the centre of the goal. Raphael Rossi Branco (Swindon Town) wins a free kick on the left wing.